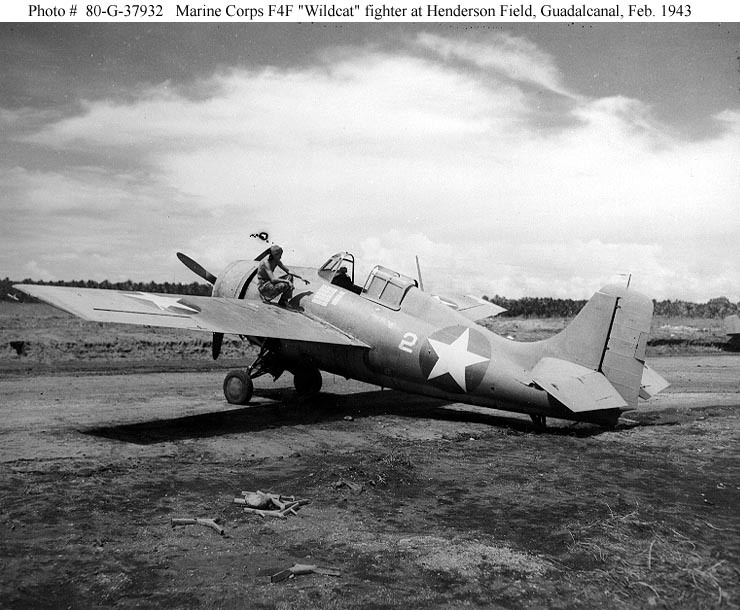 Marine Corps F4F Wildcat at Guadalcanal, marked with 19 Japanese flags. By Stephen Sherman, June, 1999. Updated June 30, 2011. The Marine Corps aces fought some of the hardest battles of the Pacific War, most notably the grinding struggle for Guadalcanal, where the few pilots of the 'Cactus Air Force' saved the beachhead from Japanese counter-attacks. Several fliers from this period, Joe Foss, John L. Smith, Harold Bauer, and Robert Galer earned the Medal of Honor in this period. The Marine fliers also figured in the drive up through the Solomons, and achieved many great successes in late 1943 and early 1944, when, equipped with powerful F4U Corsairs, aces like Pappy Boyington and Robert Hanson drove the Zeros from the skies of the Northern Solomons. Later in the war, many Marines 'made ace' over Okinawa, shooting down Japanese Kamikazes. Here is a complete list of all the USMC aces of World War Two, with links to relevant pages, where available. When I have been able to find it, I have also listed the "highest" medal earned. Gregory Boyington 22.0 C.O. Black Sheep Sqn. Robert B. Fraser 6.0 See Porter's book DFC VMF-112 F4F? Donald C. Owen 5.0 2.5 in F4U, Not Cactus? DFC VMF-212/112 F4U/? Robert G. Owens Jr. 7.0 C.O. of 215, all kills betw. Jack Pittman Jr. 7.0 3 in F4U SS VMF-221 F4U/? Nathan T. Post 8.0 5 in F4U LM VMF-221 F4U/? Ernest A. Powell 5.0 4 in F4U NC VMF-122 F4U/? Frank H. Presley 6.0 - NC VMF-121 F4U? William N. Snider 11.5 8.5 in F4U SS VMF-221 F4U/? Michael R. Yunck 5.0 2 in F4U SS VMF-311 F4U/?